TV court shows are among daytime television’s most popular programs, second only to talk shows. From former Detroit gang leader Judge Greg Mathis to the sassy Judge Judy Sheindlin, it’s hard to find a channel that doesn’t feature someone with a black robe and a gavel. Court broadcasts had their beginnings in early radio. Programs such as The Court of Human Relations (1934) and Famous Jury Trials (1936) allowed listeners to hear reenactments of actual courtroom litigation. Television breathed new life into the genre in the late 1940s with WWJ in Detroit being among the first TV stations in the United States to air a courtroom show. Traffic Court went on the air in September of 1949 with Detroit traffic judges George T. Murphy and John D. Watts and host Fran Harris discussing court cases and traffic laws. Four months later the show was retooled into a simulated court program with re-enacted court cases. Harris stepped down as the host and became the show’s producer. Judge Murphy cautiously bowed out, but Watts jumped at the opportunity to be a TV judge. 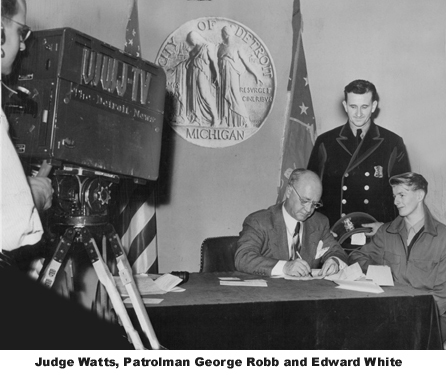 Judge Watts, a graduate of Detroit’s Central High School, the University of Michigan and the Detroit College of Law, was elected to the Common Pleas Court in 1931 and appointed to Detroit’s Traffic Court in 1945. Watts’ extroverted personality and no-nonsense demeanor was a perfect fit for the new program. Traffic Court aired live every Friday at 6:00 PM., sponsored by the Chevrolet Dealers of Metropolitan Detroit. Two or three court cases were heard on each half hour program. The actual arresting officers and witnesses were used to re-enact their cases, but actors were used to impersonate the defendants, who might still be in jail at the time of the broadcast. The actor would review the court transcript before the show and be briefed by the actual arresting officer for the case. Each participant was paid fifteen dollars for their appearance on the show. The program always charted among the top five in the ratings and had received awards from the National Safety Council and the Traffic Safety Association of Detroit. But despite the accolades the Michigan Bar Association had big problems with the program. The State Bar ruled that Judge Watts' participation violated two canons of the bar’s code of ethics; discouraging a judge’s use of the power of his office or the influence of his name to promote the business of others, and condemning use of the prestige of a judge’s position to promote candidacy for judicial or other office. Judge Watts’ argument was that the reenacted court cases were matters of public record and traffic incidents had decreased since the show had been on the air. 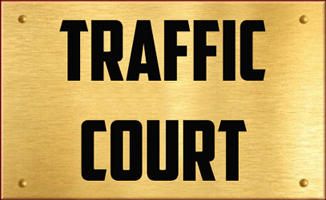 Because of the State Bar’s ruling, WWJ pulled Traffic Court from its schedule. The last episode aired on September 24, 1957. 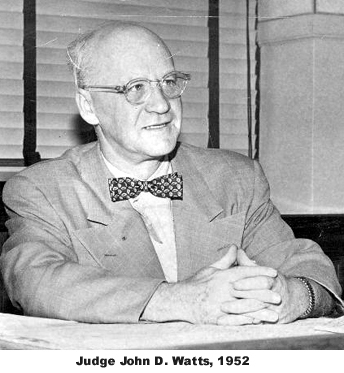 Judge Watts remained on the bench until his death in 1965.